Some of our readers pointed out that the new Asus Eee Box resembled a Nintendo Wii. And while that may be true, Asus has just debuted something straight out of Nintendo's handbook: a "Wiimote" for the PC. Spotted at a trade show in Taipei, the controller looks like a pair of wireless nunchuks, It's believed to connect to PCs through a USB transmitter and even be compatible with Asus' new desktop. 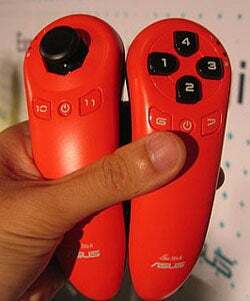 As a universal motion remote, it could be programmed for use in any game in which clicking a button just won't do. And according to reports, it could also be used as a nifty wireless mouse.